Like it or hate it, more and more phones are dropping the headphone jack, which means Bluetooth headphones are changing from an optional benefit to a definite requirement as time goes on. 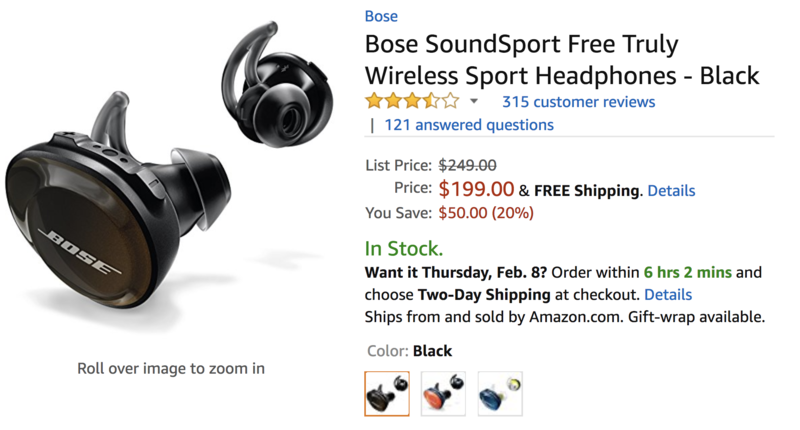 For those looking to pick up a pair, Bose's SoundSport Free were one of Android Police's favorite "truly" wireless earbuds late last year, and now you can grab your own for just $199, a savings of $50. There aren't a lot of great truly wireless headphones out there, but the SoundSport Free impressed us a lot in our review. They sound great, with excellent signal reception and a comfortable fit. Other amenities like the Bose Connect+ app and charging case all contributed to the experience, though the headphones aren't without their drawbacks. Most notable among them being poor A/V sync, mediocre membrane-button controls, and middling 3.5-4 hour battery life. And, of course, the original $250 price was a bit steep. That last problem isn't as much of a concern now that the headphones are available for $50 off, though. You even have your choice of retailers, just in case you have a preference. If you've been eyeing a pair of these headphones elsewhere, the odds are they're discounted there as well. It's still early days when it comes to Bluetooth audio, and the selection when it comes to truly wireless earbuds is slim, but with this $50 discount Bose's SoundSport Free might make a good choice.